A quality entryway door can do a lot for a home. The front door is one of the key elements to a home that has good curb appeal, and it is one of the basic elements for home security. Having a nice door is one step in achieving an attractive entryway, but you also need to take the time to maintain the door. In maintaining your home’s front door, keeping it clean is probably the most important step. A clean door will look better, and it will also last longer. Cleaning your front door is a quick and easy job, so it is something that you should not mind doing a few times a year. A good amount of dirt and debris can build up around the door, and if it has been a while since the last cleaning, it can add up. The first step in cleaning your door should be to clear all of the dirt and debris away. Get your vacuum and clean all around the door and the frame area. Use attachments like the brush and crevice tool to get into the tight spots and make sure to get any contoured areas on the face of the door. Once you have all the loose dirt and debris cleaned up, you can move on to washing the door and the frame. To do this, you can use a mixture of water and soap or you could go with a mix of water and vinegar. Open the door and wet the entire surface with the cleaning mixture. Make sure to wipe down both the interior side and the exterior side, and get all of the edges and the frame. After that, use a clean rag or a sponge to wipe off all of the grime that has built up on the door. If your door has glass, you are going to want to clean these sections separately from the main body of the door. 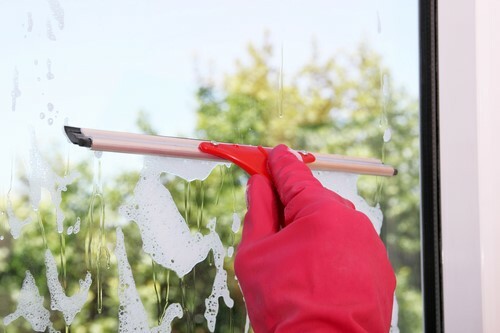 Just as you would with your windows, grab some window cleaner and a towel to wipe them down. If you want to ensure a streak free finish, a squeegee can be a great tool to have. In cleaning the door, you will also want to take some steps to clean and maintain the hardware. Check all of the hardware to see if anything needs to be tightened and check the hinges to see if they need oil. To clean the hardware on your door, you can use soap and water, but if you really want it to look good, you can use something like furniture polish. The polished hardware will look good with your newly cleaned door. A front door can be made from a number of different materials and the care and maintenance may vary depending on the design. One of the most important things that you can do to maintain your door and keep it looking good is to follow the cleaning and care instructions from the manufacturer. When you buy a new door, make sure to ask if there are any recommendations for care and cleaning. Learning and following these recommendations can go a long way when it comes to prolonging its life. In cleaning your front door, there are many commercial products that are readymade for you to use. If you have any of them on hand, and they suit your preferences, they can be good to use. However, there are homemade solutions that can work just as well. For cleaning the door itself, you could use a mixture of half vinegar and half water, or you could mix a little soap with some water. As another option, you could make a cleanser by adding a teaspoon of baking soda and a drop of soap to four cups of warm water. A pre-made glass cleaner can be good for cleaning the windows on the door, but if you do not have any, you could make your own. Just mix about five tablespoons of white vinegar and a teaspoon of detergent in with four cups of water. Cleaning the door itself is a great way to keep it looking good and to keep it in good shape. However, you don’t want to go through all of this effort only to leave part of the area looking less than clean. Since you have the door clean, you may also want to consider cleaning up around the entryway. Remove any leaves and debris that are around the area, and clean up any toys or clutter that you have left by the door. While you are at it, you can also check the weather stripping around the door to make sure that it is in good shape. At Doors of Elegance, we know what it takes to build a good door and we also know what it takes to maintain a door. Whether you need a new door or you just want some help maintaining the door that you already have, contact us today.